Was It The Michael Phelps Diet? Or the Water in Eureka? I’m sure that most of you that read my blog know that I have this propensity to go for broke when I eat. Some kid that I’m “eating for two” or three or even ten. In fact, in my last few food challenges (like the Burritozilla, Beth’s 12 Egg Omelette, Pho Garden Challenge and the Fraiche Triple Slider Challenge) I’d often remark that it looked like I’d been “knocked up” after tackling such ginormous portions. Many of these extra calories were consumed during a road trip back from the US with Kelly. I flew down to San Jose in late October to meet her and the two of us made our way home through the coast of California, Oregon and Washington. Between food challenges we hit a lot of interesting places like Napa Valley for its Wine and Eureka because I wanted to see if it was anything like the TV Show with the same name. Sadly, no. What I didn’t realize was that many of these things (my knocked up appearance, the major amounts of extra calories consumed) was simply foreshadowing for something else that would change our lives forever. Don’t believe what doctors say! The human body is still a mystery and if a doctor says they know exactly what’s wrong with you, they probably don’t. But they do try to prescribe pills, toy with your blood tests and tell you that you’ll never get pregnant with all your hormones out of whack. Well, how the heck do you explain this? I’m no doctor, but that looks like a developing fetus to me. However, based on this diagnosis, I think I could play one on TV. No, I’m not preggers, but I am the baby daddy. That’s right folks! 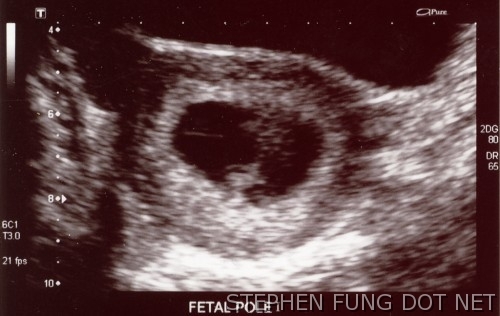 I’m going to be a DADDY! You see, Kelly was told that she would never be able to have a baby with her hormones that far out of whack. As an athlete, she already had body chemistry working against her. Add to that some thyroid disorders that come from her Scandinavian heritage and we’d pretty much be in that percentage of couples that would never be able to have children without some outside help. I guess my Michael Phelps diet helped because I developed some “Strong Swimmers” by ingesting those huge meals on our way home back to Canada. Based on what the doctors told us, “Fung Jr” was conceived on October 27th, 2009, which put us right in Eureka, California. Eureka is right. Could it have been the water too? I feel frightened, blessed and extremely excited about what this next chapter in my life brings. There are so many things to learn and so many new adventures for Kelly and I to look forward to as we begin our journey together as proud parents. The baby is due this July and I can’t wait!